Red Sea Anemonefish with its host Bubbletip Sea Anemone. Image by Albert Kok/GNU. The symbiotic relationship between anemonefishes and their host sea anemones has long been studied, but now researchers have found an apparent new benefit to the invertebrate partner. Fending off peckish anemone predators such as butterflyfishes in return for refuge, plucky clownfish have achieved a satisfactory arrangement with their deadly partners. Yet Joe Szczebak from Auburn University, USA, wondered whether there might be more to the unconventional collaboration than met the eye. According to Szczeback, coral reefs are awash with oxygen during the day, but levels can plummet overnight when photosynthesis has ceased. He says it has been shown that some damselfishes waft oxygen-rich water over corals at night and thus supplement their oxygen supply, Szczebak wondered whether clownfish might be providing a similar service to their anemone hosts. 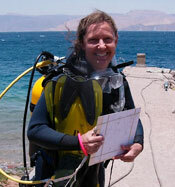 Nanette E. Chadwick, PhD, Associate Professor, Department of Biological Sciences, Auburn University. 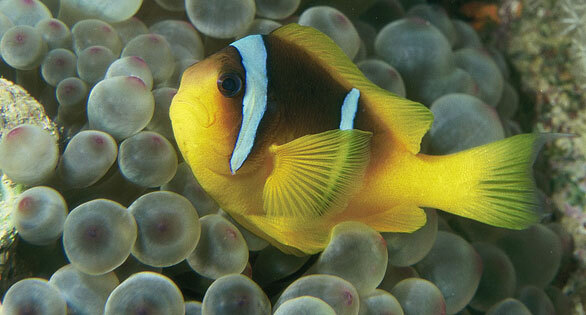 “There had been almost no research done on the clownfish–anemone mutualism at night,” explains Szczebak, so he and his Master’s thesis advisor, Nanette Chadwick, Ph.D,, decided to find out whether clownfish fanning their anemone hosts do, in fact, supplement their meagre nocturnal oxygen supply. Szczebak and Chadwick travelled to Fuad Al-Horani’s physiology lab at the Marine Science Station in Aqaba, Jordan, and went SCUBA diving in the Red Sea to find the Twoband or Red Sea Anemonefish (Amphiprion bicinctus) and Bubbletip Sea Anemones (Entacmaea quadricolor). Then the team isolated each fish from its anemone and measured their individual oxygen consumption rates before reuniting the partners. They discovered that the fish and anemone consumed 1.4 times more oxygen when they were together than when they were apart. Something was happening when the fish and its anemone were together to increase their oxygen consumption, but Szczebak wasn’t sure what. Having successfully returned the fish to their Red Sea home before flying back to the United States, Szczebak repeated the experiments with Ray Henry’s help in Chadwick’s Auburn lab. However, this time he tried an additional test. Separating the clownfish from its anemone with plastic mesh – so that the clownfish could still see its partner and they could smell each other – Szczebak remeasured their oxygen consumption, but it was still lower than when they were in contact. “There was something about the physical contact between them that was the source of the increase,” says Szczebak. Red Sea Anemonefish with its host Bubbletip Sea Anemone. Image by Albert Kok. Spending long nights filming the clownfish as they nestled in amongst their anemone’s tentacles, Szczebak realised that the fish were much more active than had been thought previously. He frequently saw the fish fanning the anemone with their rapidly weaving fins and the fish often burrowed deep into their host, sometimes making a 180-degree turn deep within the mass of tentacles to open up the collapsed anemone and apparently circulate water through it. 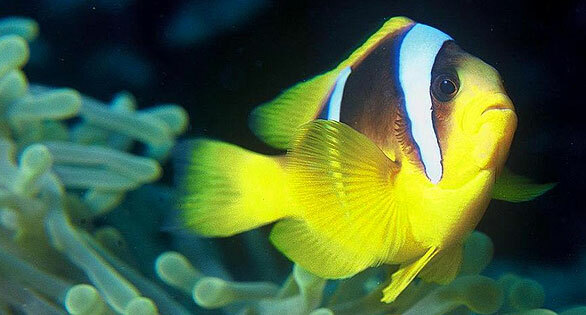 However, when Szczebak measured the oxygen consumption of isolated anemones as he flowed water through them at speeds ranging from 0.5 to 8.0 cm s−1, their oxygen consumption never increased by as much as it did when paired with an anemonefish, suggesting that the clownfish also contribute the partnership’s increased oxygen consumption. “I think that I have found foundational evidence that, like similar symbioses on coral reefs, anemonefish may actively modulate flow conditions surrounding their host to benefit them under low oxygen scenarios,” says Szczebak. He adds that Chadwick’s group is continuing to investigate why the fish indulge in their nocturnal antics and if there is for an as-yet-undetermined reason for the anemonefish behavior that provides is host with the additional benefit of improved circulation. From materials released by the Journal of Experimental Biology © 2013 Journal of Experimental Biology. News release by Kathryn Knight.